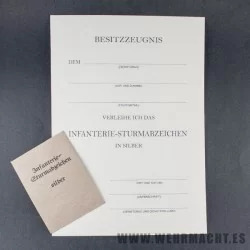 Replica of the Infantry Assault Badge certificate, printed on high-quality cardboard, includes copy of the envelope. 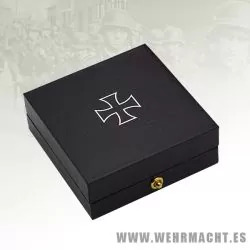 Presentation case for the 1939 Iron Cross 1st Class. 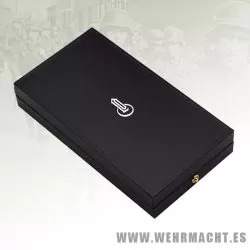 This black leatherette covered, hand made, case is lined in white velvet with a sculpted recess for the Cross. The lid is lined in silk. 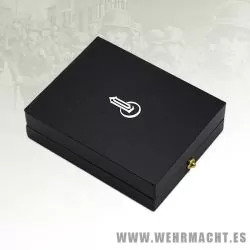 Price only box, cross not included. 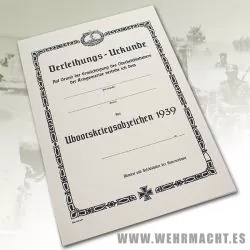 Replica of the U-Boat certificate, printed on high-quality cardboard. 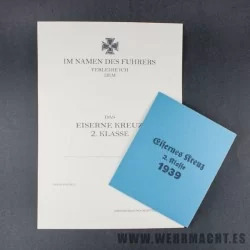 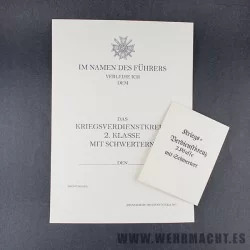 Replica of the War Merit Cross 2nd Class with Swords certificate, printed on high-quality cardboard, includes copy of the envelope. 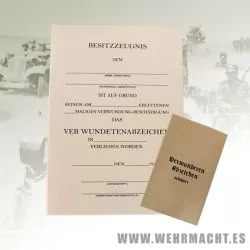 Replica of the Wound Medal certificate, printed on high-quality cardboard, includes copy of the envelope.